I came across Jolibe whilst watching an episode of Stylista and you could say it was love at first sight (and I don't even believe in love at first sight). JOLIBE designer Joel Diaz is Dominican Republic born where he spent most of his adolescent years in art school. At 14 however, he began learning dressmaking techniques from his mother. This is obviously when he discovered his love for fashion as he then went on to study fashion design at the Altos de Chavon School of Design in the DR. After receiving a scholarship to study at Parsons School of Design he moved to New York. He then pursued a career in fashion, and worked with several designers before landing at Helmut Lang and you can see the strong Lang influence in his work. In 2007 he opened JOLIBE with his partner, Christina LaPens, a photographer and art director. The Fall 2007 Collection marked the debut of JOLIBE during Paris Fashion week and has since been shown in New York. Jolibe is everything I could ever ask for in a designer - strong structured looks that can take you from day to night, gorgeous shades of fabric that will never go out of style and although the overall silhouettes are quit classic, he adds little quirky details that make the outfit stand out and really do make you feel like you've spent your money on something you will love every time you wear it. Also its hard to find new designers that have a strong sense of their own style and a vision of what they want their collections to look like for the next couple of years but I think Jolibe has delivered from the very start. I remember seeing them on Stylista and thought they were very talented. 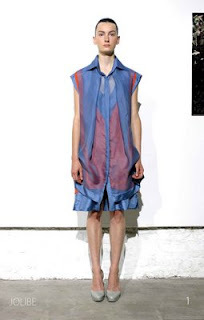 I love the sheer fabrics in S/S 09 collection..
Love the blue accents in the first dress! Well he surely is a great talent! I'm sure there are only wonderful things careerwise ahead of him! Love the coat with the front ruffle. He is showing in New York tonight. Our online store is selling variety of 2011 new style Christian Louboutin high heel shoes, competitive price, reliable quality, the most important thing is that we are top-rated seller in this domain, welcome you to have a purchase,all shoes 70%-90% off! WASHINGTON (Reuters) - MF Global's North America chief financial officer plans to tell lawmakers on Wednesday that she desperately sought fund transfers to cover the customer account shortfall in the final hours before the firm's collapse armani watches uk, but that some banks would not execute them.